I think I’ve probably said this many times to quite a lot of people, it’s become my Morocco related catchphrase, but it’s absolutely true. If you drive anywhere apart from the major motorways along the coast, you will be blown away by the scale and variety of landscapes. What’s more, lots of it feels familiar in a ‘seen it in the movies’ kind of way and because of all those romantic movie associations, every journey is moving. As I’ve said (a million times!) the mountain roads are incredible, we drove through passes that were pure cinema. I only wish I hadn’t been so scared as we were doing it then maybe I could have taken more pictures to remind myself just how damn incredible it all was; even with two children in the back killing each other over a piece of Lego. There were deserts, deep snow drifts, argan forests, a hundred dried up riverbeds, palmeries, gorges…did I mention the mountains? All this driving-related wonder comes at a price though, see my next post for more on that! 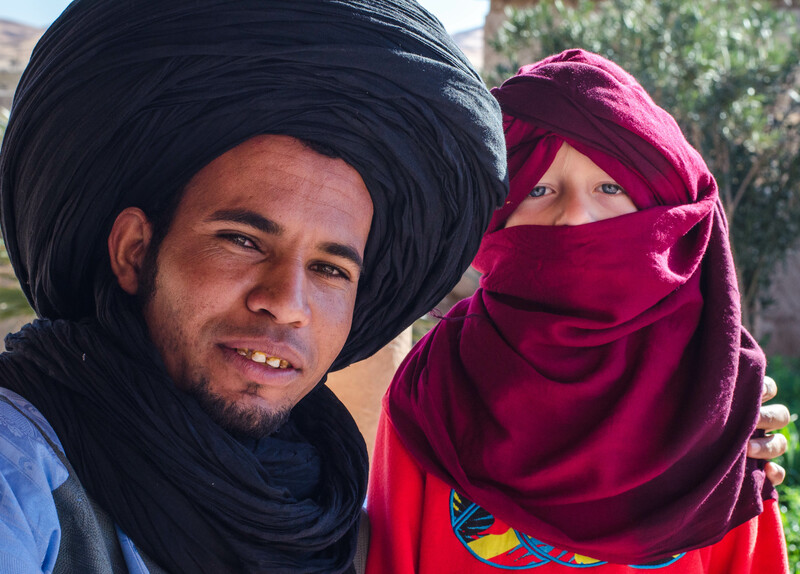 Having two male human beings under ten travelling along with us made almost everything easier in Morocco. The boys were given presents, played with, talked to, kissed and hugged almost everwhere we went. They saved us from an angry young man in Marrakech (you can read about that here), and made every situation feel lighter and more playful. Our mechanic in Tafroute adored them and called ‘cuckoo’ whenever he saw them and gave a funny little wave. 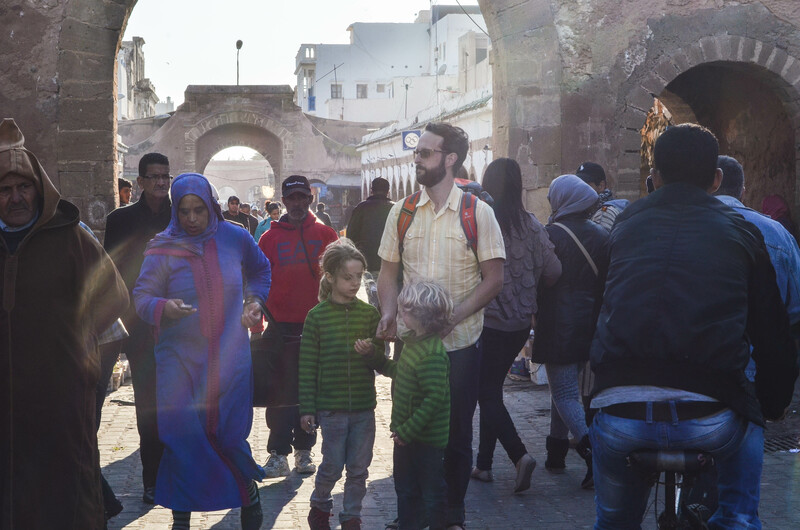 If you’ve ever been afraid to travel in Morocco with your children, don’t be. They help to open up conversations and encourage connection. Moroccan food is fantastic and all four of us had a ball exploring all that was on offer. A tagine is a very reasonably priced and delicious thing and we ate them at least once a week while we were there. Often for Monty and I it was the chicken and olive option, but we all loved the kofta and egg tagines. Moroccan salad is simple but essential eating at most meals, harira soup spicy and satisfying. As a family we sampled a variety of Moroccam delicacies from snails at Marrakech market to the plethora of patisserie that spans the land. To be able to eat good, tasty wholesome food at an affordable price is a complete blessing for the travelling family and we appreciated every meal. The Moroccans know how to cook. Almost every biggish town has one and I doubt I’d ever tire of visiting them. Often they’re the oldest part of town, so even if the outskirts are full of modern flats and shiny shops, the medina always has something of the medieval about it. 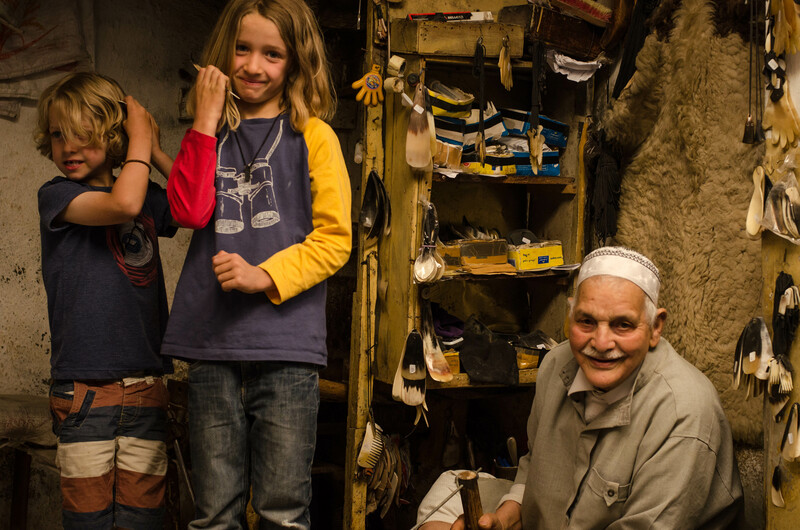 Winding passageways crammed with people, delicious aromas of frying fish and spices, more rugs than you can shake a stick at – it’s all there. 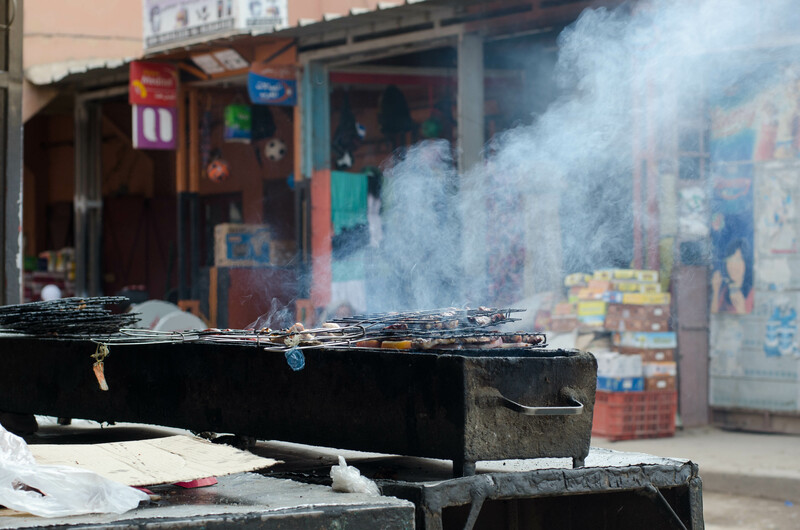 Of the medinas we visited we enjoyed Rabat for its bustle and friendliness; Assilah for its fantastic wall art and battlements overlooking the sea; Fez, for the ultimate souk experience and Chefchouen for its colour and laid back vibe. As we’re away for a year and are entirely living from the proceeds of our house sale, we’re obviously reluctant to go crazy on the shopping. That being said, it’s almost impossible *ahem*not to aquire a few things while visiting Morocco. There are rugs for sale everywhere, and I mean everywhere – even in the seeming middle of nowhere there’ll be at least two shops with carpets hanging from every surface. And they are tempting, painfully so. We swore we weren’t going to buy any as living in a van with a 1x3ft floor space doesn’t lend itself to big expenditure on rugs. Somehow though, we ended up with five, two of which are pretty big and one of which is an antique wedding rug, or handira. They’re all very reasonably priced as long as you’re comfortable with haggling. We’re not that comfortable with haggling, being polite British folks, but even so we’re fairly sure we got good deals on all of them. Jewellery is another good thing to shop for in Morocco, and there are almost as many jewellery sellers as there are rug sellers. Silver mostly, with some lovely coral and various turquoise stones being fairly common. Again, it’s reasonable but not ridiculously cheap, so don’t go expecting to come back bedecked in jewels! 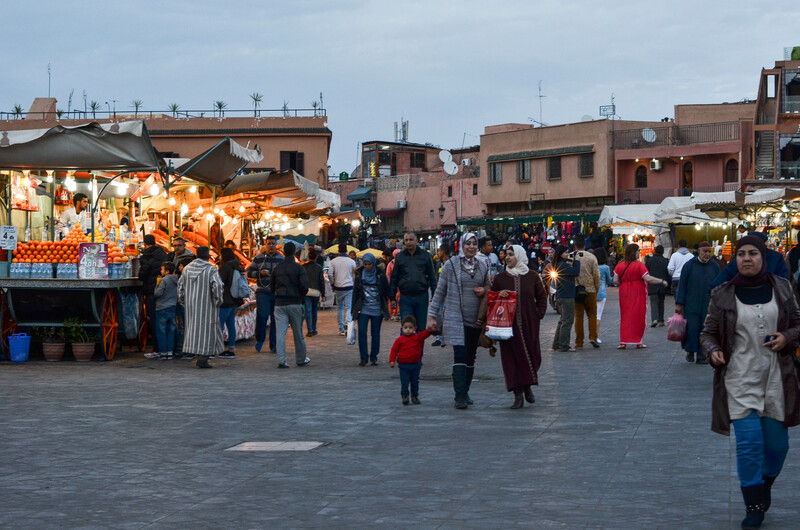 You can shop for leather goods ’til you drop; it’s a well known fact that if you visit Morocco you will come home with at least one pair of slippers. You can get fantastically cheap slippers and shoes all over the country but they all come with the characteristic smell of the tannery permanently ingrained. 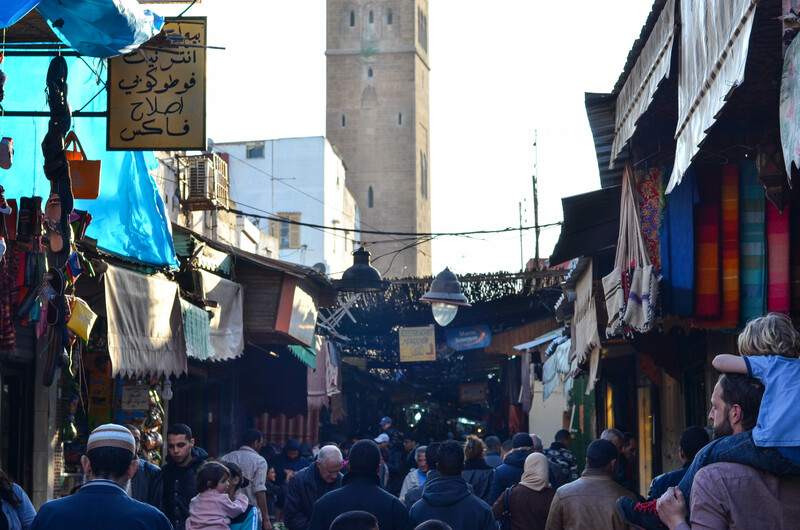 There are loads and loads of leather shops in Fez selling everything from bags to belts and full leather suits…if that’s your look. I found it very tough to not go crazy on the painted ceramics (I guessed it wouldn’t travel too well on Moroccan roads) I’m partial to a nice jug or trinket box, but had to just stand in stalls and moon over them trying to convince the salesmen that I couldn’t take them at any price. Still, I did manage to come away with six beakers, a salt dish and a tagine which so far remain intact. 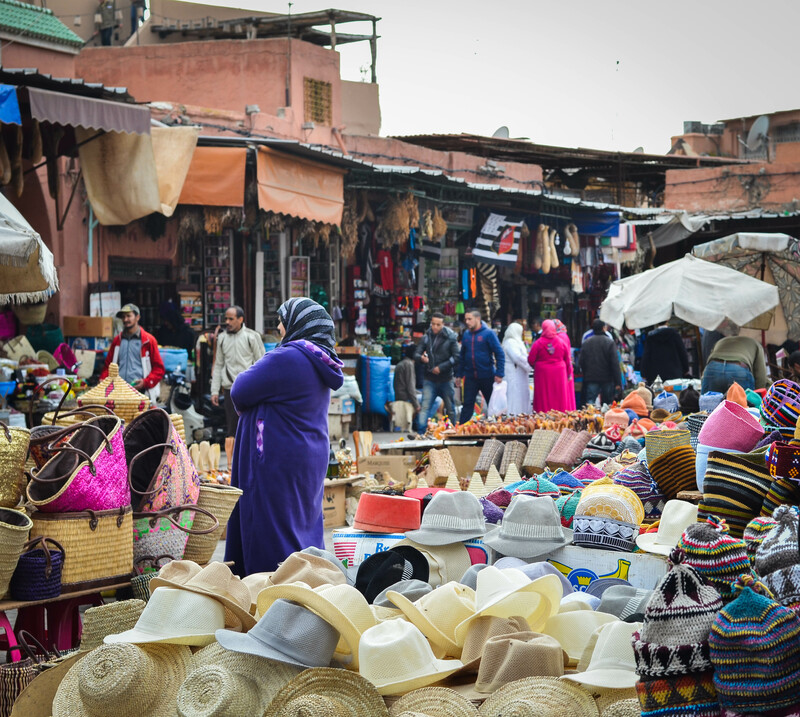 As if all this weren’t enough, there are spices, argan oil products, Moroccan rose oil, cushions, mirrors, decorative knives, musical instruments…Put it this way, if you’re going to Morocco, give yourself a generous shopping allowance! It was at Essaouira that I finally stopped feeling quite so bewildered by Morocco. It has a big lovely beach, lots of argan forests, a fantastically relaxed medina and a generally easy feel about the place. It also has the only Carrefour we came across, which, whilst not being able to compete with the price and freshness of the produce of the markets, does have a secret booze section which can come in very handy if like us you forgot to bring enough to last you your whole trip. In a way I hesitate to put this one on the list as I think generally people everywhere are pretty nice. But there is something about the Moroccan’s welcoming manner that is a bit special. A fellow traveller noted that they hate to say ‘no’ to anything and it’s true! Their eagerness to accommodate visitors to their country had me waiting in a cafe until my coffee had gone cold for the waitress to bring me some milk. She so obviously didn’t want to tell me that they didn’t have any that after I’d asked for some she just said ‘yes, yes’ then disappeared and left me me waiting indefinitely. They hate to disappoint, which can sometimes mean slightly ambitious promises are made then not kept. But it’s all done to try and keep you, the visitor, happy. Almost every Moroccan we met was friendly and warm and, as I noted earlier, went to great lengths to make our children smile. I understand that this is entirely based on our experience of the period of the year we were there. I can imagine that in the summer it is uncomfortably hot and in the winter it’ll have its share of the bleaker weather i’m sure, but for the period we were there from February to March it was great to be able to frolic about in just our t-shirts most of the time. It was occasionally cold and wet but the bright days and the heat in between more than made up for it. As I usually suffer a bit with the doldrums during a British February it was bliss to wake up to sunshine and warmth most days. Rob cites French influence, Roman relics, Spanish enclaves in the North, Portuguese incomers on the Atlantic coast and the various tribes that characterise the regions. History and contemporary culture sit side by side; young and old still wear djellabis and visit the medina with their families, but the youngsters are also well up on their global trends and like to hang out in cool cafes taking selfies and drinking Coca Cola. It’s Africa, with a pinch of Europe and a whole heap of local flair. Whilst their slightly cynical old mum didn’t quite get what she was loking for in the desert , Monty and Eli loved it. 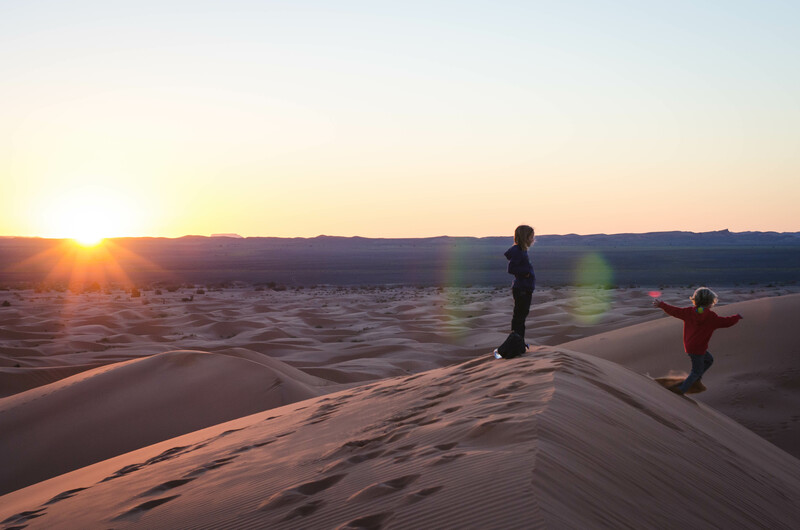 For them, riding camels, climbing enormous sand dunes, watching the sunset, camping out in a Berber tent, and then rising with the sun was the epitome of excitement. Fortunately children aren’t laden with expectations and have a fresh and open way of seeing the world that we adults could do with trying to remember from time to time. Eli did concede that the camel journey back was a little more painful than he’d have liked but on the whole, it was an amazing adventure. 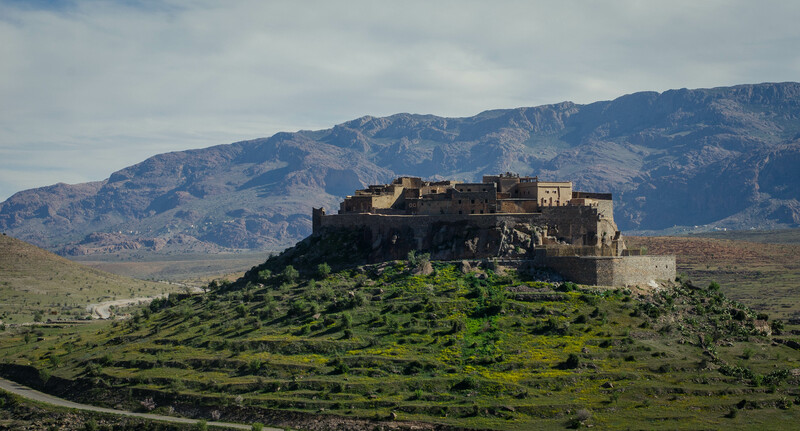 All in all Morocco’s a great place to visit for a long weekend or three month stay. 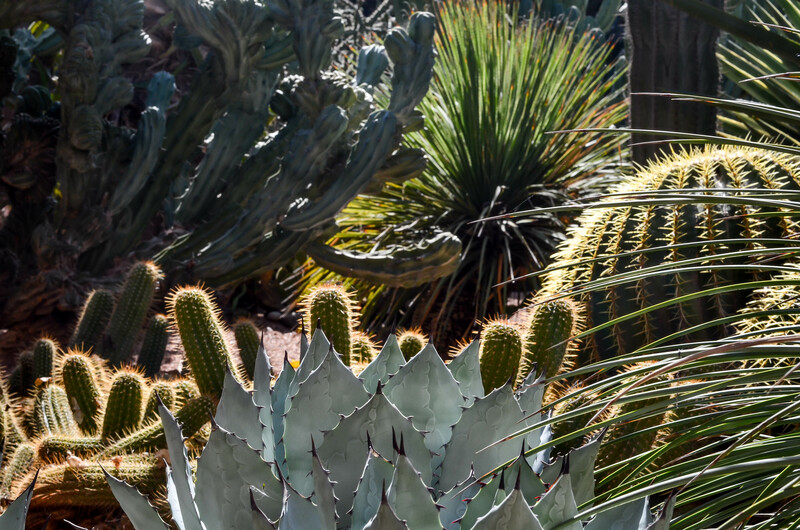 The cities are bustling and vibrant and there are natural wonders aplenty. As long as you go prepared, there truly is something for everyone. Thanks! Your site is an interesting mix of stuff! I totally agree with the points on your list. What a great experience you’ve had. Thank you for sharing. It’s a pleasure! Have you been to Morocco? Would you add anything?